Leah Sewell grew up in a variety of places in the U.S. She was the daughter of a dairy manager who moved her family to many farms in places like southern Arizona, Maryland, Michigan, and Wisconsin as a young child. Her family later lived in Chicago’s north side and Skokie, Illinois and Rockford, Illinois. She set out on her own to Minneapolis, where she met some Kansas folks and was subsequently lured to Topeka, Kansas, where she now lives with her two kids, Sylvia and Oliver. She’s called Topeka home for over ten years, which is the longest she’s ever settled anywhere. Sewell has a BA in English / writing emphasis from Topeka’s Washburn University and a minor in Women’s Studies. At Washburn, she founded the monthly entertainment magazine, The Argo, and began the annual student publications fundraiser, the Jayhawk Theatre Revival. She was the editor-in-chief of Topeka’s arts and entertainment magazine, seveneightfive, for five years, and the founding editor of Topeka family and lifestyle magazine, XYZ, and one of its current owners. She was awarded the 2010 Women Making Headlines Award for her work in media by the Topeka Association of Women in Communications. Sewell’s poetry has been published in [PANK] Magazine, Rufous City Review, Weave Magazine, Flint Hills Review, Midwestern Gothic, Stone Highway Review, Mochila and other journals, and was nominated for a Pushcart Prize in 2012. Her chapbook, Birth in Storm, was the winner of the 2013 Emerge Publications Chapbook Competition. Sewell is an assistant editor at Coconut Poetry Press (Atlanta, GA), the moderator of the Topeka Writers Workshop, and a book designer who has created over a dozen titles for Kansas and national presses. She’s currently a candidate for an MFA in Poetry from the University of Nebraska. my eyes the red of rusted hulls. my mood is to love or to snare. In place of boys, I'll ride the narwhals. --all of it blamed on the weather. to be something more than a girl. & dive safe below the worst weather. Issue of Rufous City Review, p. 20, "Fast Turn." Leah Sewell in Kansas Time + Place. 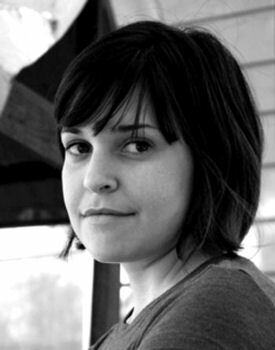 Leah was nominated for a Pushcart Prize in 2012.